I’ve never been great at keeping things that must be shared, and if ever there was a pumpkin pie that must be shared, this is it! (Besides, who’s crummy rule was it anyway that we have to wait until Thanksgiving to have pumpkin pie?) Why do I love this pie? Well, for one thing, it’s the first pumpkin pie I’ve ever eaten that didn’t taste like, well, every other pumpkin pie. Second, it’s as easy as pie to whip together. 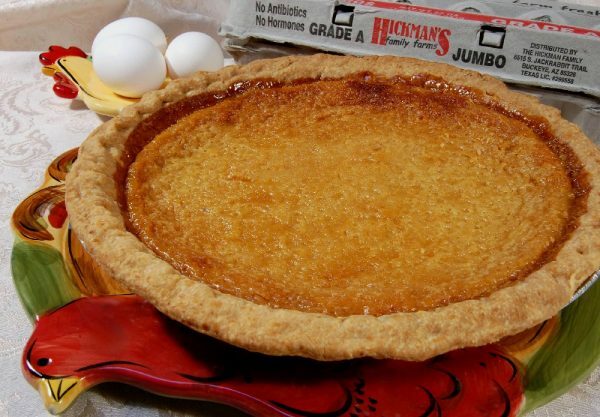 This cherished recipe comes to us from the matriarch of Hickman’s Family Farms, Arizona’s family-owned egg farm since 1944. “Grandma” Gertie Hickman, her husband Bill and the Hickman family are the last remaining egg producers with chickens and a USDA-inspected processing plant in the state. (At one time there were about 1200 independent egg farms in Arizona.) For Bill and Gertie, it all started with one little refrigerated panel truck and a few hens. By the end of this year, Hickman Family Farms will have about 5 million chickens! Through the years, Gertie has had more than chickens to feed, as co-owner Sharman Hickman, Gertie’s daughter explains. “Besides Mom making gigantic breakfast, lunch, and dinners for five kids and construction crews, she baked more pies than you can count. I think all of us–four brothers and me–thought everyone’s Mom baked 4 lemon meringue pies, 6 pumpkin pies, 2 date-nut loaves, and 4 pecan pies for Thanksgiving until my brothers started dating girls whose families made “store bought” pies! I had no idea how much work Mom was actually doing until I started cooking for my own family of four!” Thank you, Hickman’s and Grandma Gertie for sharing your treasured family recipe. It’s one we’re going to flock to all year long! If you ever run out of Pumpkin Pie Spice, making your own is delicious!